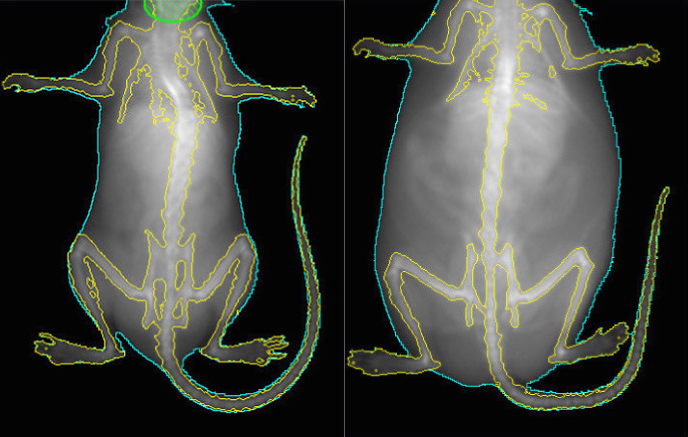 Weighty matter: Mice lacking a gene called RAI1 in certain neurons (right) overeat and become obese. Subsets of neurons lacking a gene called RAI1 contribute to Smith-Magenis syndrome, a rare condition related to autism, researchers reported last week in Neuron1. RAI1 is either mutated or missing in people with the syndrome, which is characterized by movement problems, obesity, sleep disturbances and intellectual disability. People with the condition also have social difficulties and repetitive behaviors reminiscent of autism. Smith-Magenis syndrome affects only about 1 in every 15,000 people, but mutations in the gene have also turned up in people with autism. RAI1 encodes a protein that controls gene expression, but until now, its targets were not known. In the new study, researchers removed the gene either from a whole mouse brain or from each of six different cell types. They found that loss of the gene from certain subsets of neurons triggers particular features of the syndrome in mice. “Some symptoms are contributed to by more than one cell type, and some cell types contribute to many symptoms,” says study leader Liqun Luo, professor of biology at Stanford University in California. Luo’s daughter, Connie, has Smith-Magenis syndrome. The researchers also identified the genes that RAI1 regulates. “Knowing the downstream targets of RAI1 is going to be a very important avenue to keep researching,” says Katherina Walz, assistant professor of human genetics at the University of Miami in Florida, who was not involved in the work. Characterizing the targets may help researchers develop therapies for the syndrome, she says. Luo and his colleagues analyzed tissue from mouse brains and found 15,000 sites in the genome where the RAI1 protein binds. Most of these spots coincide with regions along the DNA where proteins bind to turn genes on or off. To pinpoint RAI1’s targets, Luo and his colleagues generated mice that lack RAI1 throughout the brain. They found that in these mice, some of the genes near RAI1 binding sites are turned off, suggesting that RAI1 normally activates them. Many RAI1 targets are involved in assembling and maintaining neural circuits. Mice lacking RAI1 show several features of Smith-Magenis syndrome. At 20 weeks of age, they are obese, weighing up to twice as much as controls. They also have trouble on a standard test of learning and memory, and struggle with balance and movement. The mutant mice do not show unusual social behavior on two standard tests, but Luo and his colleagues plan to revisit this result using other tests. Luo and his colleagues then bred mice missing RAI1 in only particular subsets of brain cells. They found that mice lacking the gene solely in their astrocytes — star-shaped cells that support neurons — do not show any features of the syndrome. By contrast, loss of RAI1 from ‘inhibitory’ neurons, which dampen brain activity, results in learning and memory problems. The effect of RAI1 loss from ‘excitatory’ neurons — those that enhance brain activity — depends on the cells’ location in the brain: It has no effect when removed from both the cerebral cortex, the brain’s surface layer, and the hippocampus, an internal memory structure. But in the rest of the brain, deleting the gene in excitatory neurons leads to motor problems, cognitive difficulties and obesity. The researchers identified two sets of excitatory neurons in the hypothalamus, which controls appetite, as the root of the rodents’ obesity. Deleting RAI1 from either type of neuron causes the mice to overeat. These neurons show dampened expression of HTR2C, a receptor for the chemical messenger serotonin. A 1995 study showed that mice lacking this gene tend to overeat2. Luo’s team is giving the mice a drug that activates HTR2C to check whether the drug can reverse or prevent the weight gain. The pathways and cell types the study highlights may also be relevant for similar features in other conditions, including autism.